The best way to explore really is on foot but two wheels are a great alternative. Sure it is exhausting and limits the amount of areas that can be covered, but the experience is palpable. Plus, it is a healthy and environment friendly option. So, after our overnight stay at Whispering Palms, we decided to go around the island on two wheels. They offered us free bike rentals. Woohoo! Geographically known as Refugio Island, Sipaway is located between the islands of Negros and Cebu. To its west is Refugio Pass and Tanon Strait on its right. It is only about 10-15 minutes boat ride from the port of San Carlos City, my mom's hometown. The island is only around 7 kilometers so exploring from tip to tip on a bike is possible. Our starting point, of course, is Whispering Palms. This is an amazing, amazing resort. It is a German-owned diving resort but non-divers like me can find lots of fun things to do in this resort. The resort has its own mini zoo, a mangrove forest, a gym and a massage area. For those who just want to lounge around, hammocks are provided in each room and there are lots of cabanas. But, the best for me is the happy hour, which gathers everyone at the bar. Oh yes, bikes are free. The hotel manager, Stefan, lent us a map, which was in German. He translated for us and recommended the places we could visit. So, following the map, I had another tour of the island. First stop was the balete tree. The tree was kinda hard to miss with the colorful tiles adorning the place. It is located inside a school compound. This tree is a century old and is mentioned in different tourism brochures as one of the attractions of the island. After Balete tree, we decided to look for food, and along the way, we caught a glimpse of the very simple, laid back lifestyle of the island. The stopped by a few carinderias (small restaurants) to get a fill of local food but we didn't find any meal we like. We tried to locate the places recommended by the locals but we couldn't find them so we just decided to wait til we get to San Carlos City for lunch. We were enjoying our biking anyway. Sipaway is known for its beautiful, unspoiled beaches. The more popular ones are Ermita and San Juan. San Juan and Ermita are both residential areas and they both got beautiful white sand beaches. I have lots of fond memories of the clear, knee deep waters of San Juan and the star fishes. We spent one afternoon there with my relatives, just sitting in the water and sharing stories. Ermita is the more developed beach. It has resorts and cottages for day trippers. This side is better for swimming, even snorkeling. Anyway, since both beaches are on the far side of the island, we just decided to explore the less popular coasts, and we found these. There are so many other places good for picnics with family or friends; lesser used ports but picturesque, nonetheless; and more of island life. 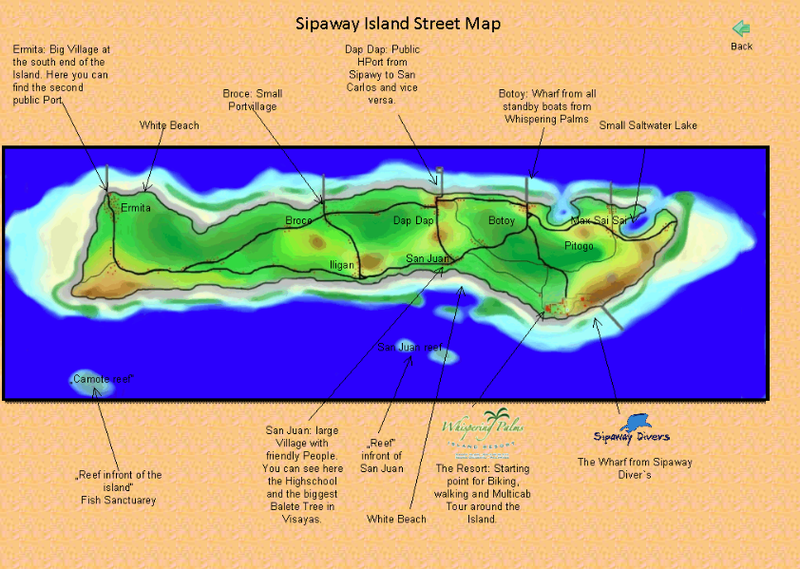 We got a bit lost but we got back on track thanks to the nice people of Sipaway Island. That was a good exercise. We burned out some of the remnants from the previous night's lechon buffet and got to see and feel more of Sipaway Island. We returned our bikes and hailed a tricycle back to Baybay, the main port of the island. That was another memorable visit to Sipaway. I would always love this island for its simplicity and natural beauty, and of course, abundant marine life. Looking forward to the next.